Some early Nanowrimo wrap-up stuff. Well, we’re kinduv into the eleventh hour of the eleventh month here… 😉 I’ve got one more Nano Spotlight ready to go for tomorrow, so today I thought I’d ramble about some general Nanowrimo stuff, looking back at the month. My first year as a Nanowrimo ML. I had a blast, helping plan the Kick-off and taking the lead at write-ins when Gale wasn’t around or wanted to get to writing. When I was in Hamilton, I was racing off to at least 4 write-ins a week, (Sunday, Monday, Thursday, Friday,) and while in San Francisco, I crashed 3 write-ins in four days, plus the Night of Writing Dangerously. I made some new friends, got to spend time with familiar faces from long ago, and a lot of words done. My new target for the month is 64,000 – a little less than I made last year. It’s also just over 10k more than the finishing word count of “The Snow Job”, and 10k sounds like a nice number of words for sample chapters, so that’s what I’ll be pushing for with my Missing Gnomes at the write-in tonight and the big Wafflepalooza write-in/party tomorrow! I think I’m going to leave you with some favorite photos from my trip to San Francisco. The full photoset is up on flickr. Donation Day and what Nano means to me. Well, it’s Donation Day over at National Novel Writing Month; in fact, it’s nearly over, but the donation fun has not been sold out. You still have a chance to win some of the hourly prizes, and the Office of Letters and Light is going to be releasing a special cover song in thanks for donations of over fifty thousand dollars today. And they still need more to cover the cost of putting on such a fabulous world-wide writing event! I don’t have as much free money to donate around as I have in some previous years, and I’ve already donated two hundred to get into the Night of Writing Dangerously dinner, but I scraped up another twenty-five to join in the Donation Day fun. I didn’t win the hourly prize I had my eye on, but that’s alright. In conjunction with Donation Day, Nanowrimo is asking people to tweet about ‘what Nano means to me’, and that got me thinking that what it means to me is probably too much to fit into 140 characters. For one thing, it means all the friends, both at home and around the world, that I’ve met through Nano. I’ve always been shy in public situations, and I actually remember that the first time I went to a local Nano write-in, I sat at the next table and then left before the two MLs (chatting to each other) realized that I was a writer. But bit by bit Nano pulled me into the social side, and this year I’m the Co-ML, welcoming every wrimo to the write-ins and loving it! On another level, Nanowrimo means something deep about the universal power of story-telling and how it draws us all together. Okay, so – I am trying to set my pace to reach 50,000 words at the Night of Writing Dangerously banquet in San Francisco, and since it falls on Nov 18th this year, that means my target is a somewhat staggering 2778 words per day. And I’m just on target! My word count at the moment is 19,510 words, which is actually 7.02 days worth according to my word count spreadsheet. I was feeling a little doldrum-ey today, still several hundred words behind even after writing on the bus, but I joined in some #NanoWordSprints and made up the difference. I kinda like the way the story’s going so far. My characters have explored a lot of the planet Chazwa and gotten involved with Jo Grant, (name subject to change, since I didn’t realize that Doctor Who had dibs,) who’s recruiting them into some undercover shenanigans to con criminals. It’s moving a bit slowly, but then, I don’t need to get to THE END by 50k, and I’m not sure I need to finish it during November, though that would be nice. This is better than the opposite problem, of running out of story before I reach 50k. Are you doing Nano? How’s it coming so far? Any sign of the doldrums? I just passed my first 1000 words, (1145) thanks to 2 morning sprints and an afternoon sprint. Soon I’ll be heading down to a write-in at Williams Coffee on the Pier. Whoo-hoo! It’s so great to be in the crazy excitement of Nano again, and to be doing my best to lead such a great region. Hopefully I can get up to 2778 words for today – that’s my daily quota to reach 50k by November 18th. I’d feel like I was letting myself down if I didn’t ring the bell at the Night of Writing Dangerously in San Francisco again. How’s November treating you so far? The next leader of the Office of Letters and Light! Like many people who went to the Night of Writing Dangerously in San Francisco last night, I thought that the ‘big news’ was going to be the fact that this was Chris Baty’s last year as the Executive Director of the Office of Letters and Light, the non-profit that runs Nanowrimo, Script Frenzy, and the Young Writer’s Program. I don’t know about anybody else there, but I was very excited about an announcement that Chris made in the middle of his moving thank-you speech – naming Grant Faulkner, board member of the Office of Letters and Light, as his successor, and thus our new Fearless Leader. I don’t know much about Grant. 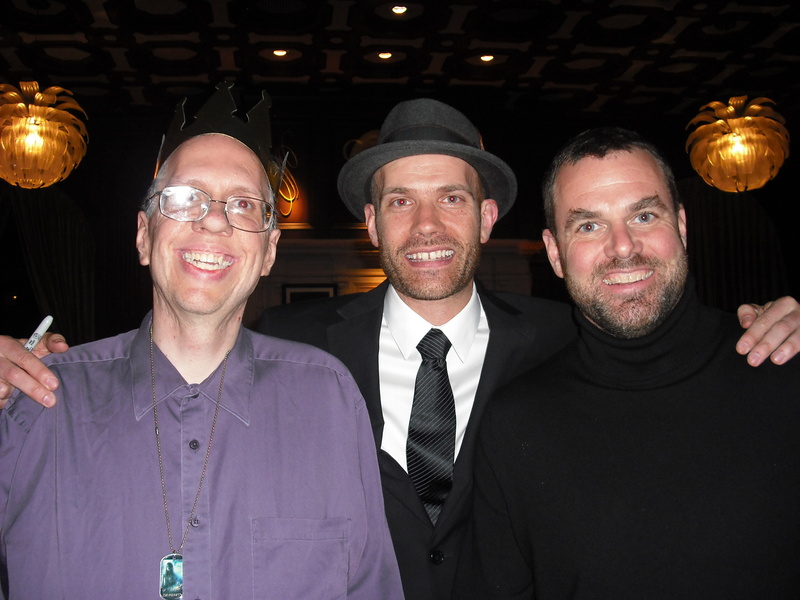 I managed to get a moment to congratulate him at the dinner, and even got my picture taken with Grant and Chris Baty. But he seems cool, and like a reasonably good choice to follow in Chris’ footsteps, even if he also reminded me a little of Adam Baldwin, who wouldn’t really be the kind of guy I’d ask to lead me into 30 days of creative craziness. There’s the big trip, of course, to Lawrence, Kansas for the CSSF workshop, last week of June and first week of July. Dragon*Con 2011, Labor day weekend in Atlanta! Fan Expo 2011, the week before in Toronto. Going up to Toronto for a day or an evening doesn’t really count as a trip on the same level as flying to the states, but when I’m booking a hotel room in the city for the weekend, then I tend to count it. And, I’ve just made the arrangements to go back to San Francisco in November, to attend the Night of Writing Dangerously for my third straight year! I’m planning to go to Polaris as well, wouldn’t miss my chance to go and see Adam Baldwin, but haven’t actually booked the ticket or the hotel yet. I’ll need to do that soon, as the online ticket sales deadline is in just a few days. And I think that when all of that is done, I’ll still have some vacation time left, because my boss confirmed that I qualify for four weeks off this year. Where else should I go – any ideas? Nanowrimo Day 23 – jumping from story to story. It’s been a good few days, since the Night of Writing Dangerously. I took a couple of hop-on, hop-off bus tours of San Francisco on Monday, touring around downtown, climbing up to the top of Telegraph Hill, (but not to the observation deck of Coit Tower because the elevator was out for repair,) and crossing the Golden Gate bridge. I’ve also been attending a number of local San Francisco write-ins – last night at the Blue Danube cafe, this morning at Nervous Dog coffee in the mission district, and this evening at Epicenter. It’s been great going to all of these different neighborhoods in SF, meeting other writers, and adding onto my word count. When I was planning for Nanowrimo, I said that if I actually got to 50k on or around the 21st, and finished my novel idea then or soon after, I would keep writing at more or less the same pace and work on science fiction-based short stories, especially ones that I could consider submitting for Clarion and Clarion West. At the NOWD, I pulled out one, ‘Harry and Mars,’ a story that I’d started around the end of September, (as part of my September projects list, ‘Start a new science fiction story’,) and abandoned since then. I actually made a lot of headway on it Sunday night, and finished it yesterday soon after getting to the Blue Danube. Ack. ‘Now what?’ I didn’t have any other sci-fi ideas waiting and ready to be written. I ended up trying an incomplete fanfic chapter just to see if the words would flow there, though I hadn’t really planned to do any fanfic during November. Sure enough, Michael Guerin and Lana Lang’s crossover chemistry was still working fairly well in chapter 3 of ‘A Roswellian Alien in Metropolis’, so I kept working on that, through the Nervous dog write-in this morning, and finished the chapter at Epicenter. I really didn’t want to start another fanfic chapter during Nano, so what next? Asha, the other Nano-er who made it to Epicenter, had mentioned something about brainstorming, so I actually opened up a scratch pad file on the Dana to list out possible notions, just starting from my ideas about what Science Fiction was. Slowly a new idea gelled, a sort of sequel notion to my 2009 Nanovel, and also a psychological mystery, about a commanding officer who must decide if one of his specialists is a psychotic delusional, only paranoid enough to lie to him, or if one of the specialist’s team members actually did steal something valuable from him. Of course, writing a mystery without knowing ‘who done it and how the sleuth figures it out beforehand’ can be a great way to write yourself into a block – I have a strong notion, but won’t tell you now. A few trivia items relating to ‘Harry and Mars.’ A few months from now, in the spring of 2011, we can celebrate the 50th anniversary of the first human being entering Earth orbit. And also, I mention something in the first draft of ‘Harry and Mars’ about there not having been anybody who died in space before, as opposed to fatalities within Earth’s atmosphere when a spacecraft was taking off or landing. Unfortunately, I didn’t research that enough to find out about the Soyuz 11 disaster, and will have to rewrite it. Sweet selections with Chris B and Lindsey G tomorrow – I can’t wait! Nanowrimo Day 21: The NOWD has landed! 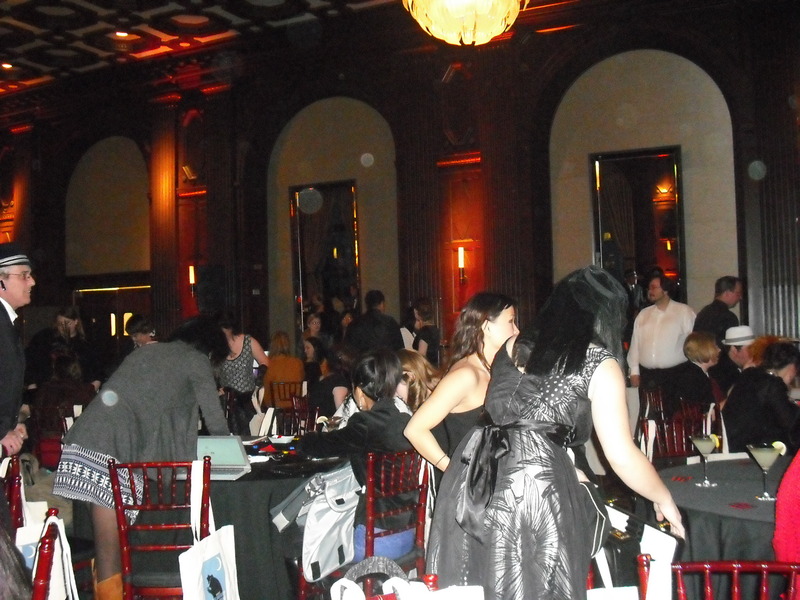 5:30 pm Pacific time – have chosen a table and set up my netbook, made my choices for the raffle, and begun entering words. 6:45 pm Pacific time – I hit 50,000 words! I was the seventh one to ring the big bell for winning. Sarah was joking about running back and forth to announce winners all night, but I don’t think anybody’s rung in the past ten minutes or so, since me and the lady after me. Chris Baty gave a great speech about “If we have it in us to write a 50,000 word book in 30 days, what else do we have in us?” I managed to catch all of it in video on my digital camera. Rachael Herron’s talk about how to move from Nanowrimo to publication was also amazing – hitting a lot of the things about revisions and query letters that I’ve been thinking about lately, with practical advice from the perspective of somebody who’s recently been through it all. I also enjoyed Jen Arzt’s talk about Script Frenzy, though it was more aimed at those who’ve never tried the Frenzy before, not veterans like me. I went up to her afterward and thanked her for the effort that she’d put into running the event, and mentioned the ‘Beat sheet’ series that I was running on this blog a few months ago. 2 other writers from our table hit the 50k mark before the night was out. I got some great material written for “Harry and Mars”, a short psychological sci-fi piece that I started at the end of September. Turns out it might be even shorter than I expected, for the first draft at least. Nanowrimo day 17: Pie on my face. Haven’t had time to blog much, been busy writing! Up to 39,563 – and I want to at least hit 40k before I finally go to bed tonight. Plot’s coming along pretty well too, and I’m having lots of fun, which is the most important thing. Well, fun and word counts might be tied for most important. Had another busy weekend, including a great Midway party – dinner out at Kelsey’s Bar and Grill in Westdale. Went out to the Hamilton Writer’s meeting at Chester’s last night, instead of going to an unofficial Write-in at the Williams on the bayfront, and it was a very good choice – I read out the first scene of my Nano from the Dana alphasmart screen, got some positive feedback, and we had some interesting discussions between those who are trying their hands at Nano and those who have steered clear. Also got to critique a new chapter from Rob’s latest thriller, and an article on hearing loss. In other news – I fly out to San Francisco tomorrow. Because I knew that I’d be in the Bay area for a while, I actually coughed up a substantial donation to the Office of Letters and Light – the one that includes ‘certificate good for pie with Chris Baty and Lindsey Grant.’ Figured that it’d be a cool experience, and the money goes to a good cause, right. I wasn’t sure what the protocol was for arranging the meeting, but since there weren’t any further instructions with the email receipt of my donation, I figured I’d need to check the certificate itself. Waiting for my package of official donor goods has been an interesting and tense experience. Now, I actually coughed up the money on Halloween, and I wasn’t really expecting any miracles from the shipping. Two package slips for pickup were in my mailbox on Friday evening, after I got back from the write-in at McMaster. I actually assumed that two packages would cover everything. When I went up to the drugstore over on Rosedale, Saturday, I got two of the rolled tubes that they send posters in, (and occasionally use to play make-believe robots ) and sometimes stuff other goodies in. Toted the tubes back home, unpacked them. Two nifty posters, but that was all. Okay, this was getting tight, I realized. But there was still a chance to get the certificate before I flew out, and if not, I’d just send an email and explain the predicament, right? When I went by my apartment yesterday between work and Chester’s in Gore Park, there was another package pick-up slip in the hallway outside my door. Actually considered going home from Chester’s via Rosedale before it closed, but the rain was miserable and I didn’t end up doing that. Took a detour on the way home tonight instead. Three weeks before my arrival? Yeah, I can understand the preference for some warning, but I’d need to route my email server through the TARDIS to pull that off now. Of course, my ‘arrival,’ tomorrow, isn’t really the key. The important item is my departure from the Bay area, which is not quite two weeks away. And I have to say, I don’t expect to be visiting the San Francisco area again in the next year. I immediately rushed over to the computer and typed out an email explaining my predicament and asking if anything could be done. Still waiting to hear back, so best wishes for a happy ending gratefully accepted! PS: For the record, I don’t really like pie. Do you think that they’ll let me eat cake?